Recorders are such a great way to experience music, and Recorder Classroom magazine is an excellent way to teach recorder. This amazing resource provides great new music, state-of-the-art recordings, and lots of variety! 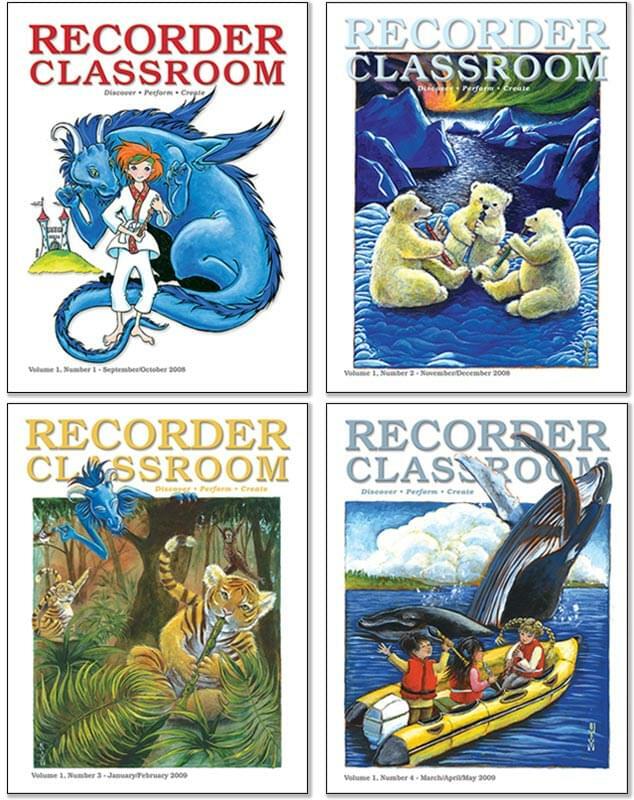 Each issue offers many types of recorder music including Orff arrangements, exercises, warm-ups, technique builders, and lessons designed to encourage creativity. And we keep the National Standards in mind to help you plan your lesson objectives. Every issue also has a wide array of great content available on our web site. There are optional parts, scores, teaching aids, PowerPoints®, and files for color printing and projection. Regular features include "Recorder Method Energizer" which presents intriguing new settings of tunes and techniques to enhance the learning experience. Another unique feature is the "Virtual Consort" that lets your students experience the joy of playing with a real consort with recorded parts played by professionals. Look for "Idea BAG," a special section where teachers can share ideas and lesson resources with one another. There is also a regular column from master teacher Artie Almeida called "Fun Foundations For Recorders," and other special contributors including renowned recorder guru Norm Sands, a creative teacher and clinician. Watch for special kid-friendly characters like last year's big hit "Zippy Toad" with his silly rock teaching tunes and a new character, "Dexter the Dragon," who gets his first recorder and learns how to play it along with your students. An account will be created for you at checkout, if you do not already have one, so you can access all the free web extras. Read more about this great teaching resource on RecorderClassroom.com. Save $46 - $60 by buying the whole back volume! Recorder Classroom, Vol. 1 - Downloadable Back Volume - Magazine with Audio FilesAccess downloads at RecorderClassroom.com. An account is created for you after you purchase your back volume: Read your e-mail carefully. Recorder Classroom, Vol. 1 - Print & Downloadable Back Volume - Magazines with CDs & Audio FilesAccess downloads at RecorderClassroom.com. An account is created for you after you purchase your back volume: Read your e-mail carefully.